Rapid Cart is a feature which allows shoppers to buy items from your ArtFire studio without ever having to actually visit your studio. Rather, buyers can shop and make purchases straight from your Rapid Cart posted on your blog or website. 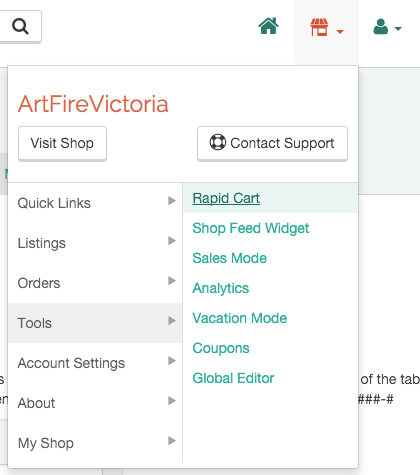 To use your Rapid Cart, first click the Store Front image at the top right corner of any ArtFire page to reach your MyArtFire. Under Tools" there will be a Rapid Cart tab, click on it. On your Rapid Cart Setup page you can fully customize your Rapid Cart. The items in your Rapid Cart will automatically be chose for you. In order to decide how your Rapid Cart will be shaped and how many of your items you want to show, use the drop-down menus. There's lots of room for customization here, as you can make your rapid cart long and skinny, short and wide, rectangular, square, whatever you want. Using these features, you can display up to 25 items from your studio within your Rapid Cart. Use the "Preview Rapid Cart" button to decide on the best layout for your blog or website. Once you're satisfied with the look of your Rapid Cart, copy the blue code on the right hand side of the screen. Make sure you copy the entire code or else your Rapid Cart won't display properly. Next, just post the copied code into the side bar of your blog or website. Since the window is written in Flash, it should work on most sites. If you edit a product displayed on your Rapid Cart, don't worry, your Rapid Cart will update automatically. Rapid Cart will not select an item that has been sold, so if you have an item listed in your Rapid Cart, whether by selection or randomization; it will be replaced with another item in your Rapid Cart. If you sell all items in your studio (yippee! ), your Rapid Cart will refresh with random items from the site. Note: Your Rapid Cart will not function properly while your studio is set to Vacation Mode. All transactions on Rapid Cart are secured by 256 bit high grade encryption to keep information entered private and safe between the buyer and the seller. 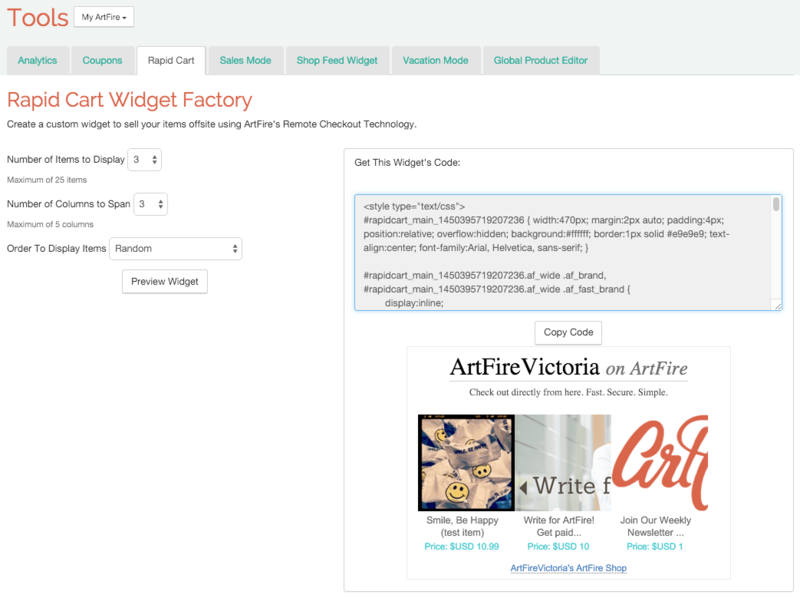 When using Rapid Cart, buyers have the option to purchase items directly from your blog. With our No Account Checkout feature, they can choose to buy from your studio without ever having to sign up on ArtFire. If a fellow ArtFire member wishes to make a purchase from your Rapid Cart, their information will be transferred from ArtFire so long as they are logged in. Checking out on Rapid Cart is very much the same as checking out on the site, and shoppers are even able to do so without having to first set up an account on ArtFire. It's a simple three-step process, and at the end buyers can choose to pay using one of your accepted payment services. Shoppers also have the option to contact you through the ArtFire message center if they have a question or comment on the item. They can also view your studio or the item listing page if they so choose.